Just because the bubble hasn't popped yet doesn't mean that the bubble isn't real. For the past two years I've been writing articles on this blog about the subject, presenting detailed analysis of my own and of others. Yet nothing happened. Prices didn't fall. In fact, they went up. During the past two years alone, condos in the city went up by 15% and detached homes increased by 23%. (comparing September 2013 vs September 2015). You may justify detached homes going up more in price than condos due to the limited amount being built. For instance only 11 new low rise homes were sold in the 416 in August 2015 while 660 high rise units were sold. Fine, limited new inventory of low rise units justifies the 8% difference in price between detached units vs condo units in the 416. But why did condos go up by 15% ? Is it because we make more money? Is it the immigrants? Or maybe it's the green belt? Or maybe it's just because real estate prices always go up! Hmm, maybe I should jump in the market and buy. The average price of a condo in the city of Toronto was $418,603 in September. Five percent down would be under $21,000. But hey, all it takes is for prices to go down by 5% or more to wipe out my down payment. I would be down $100,000 if prices were to drop 23%. 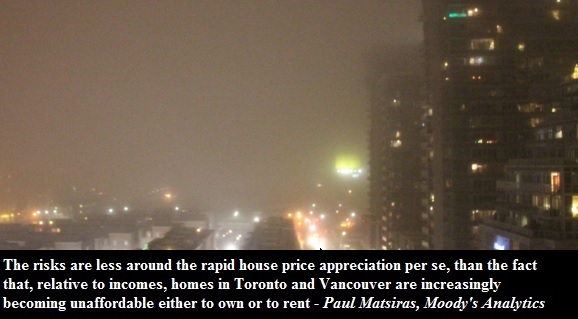 Of course prices won't go down 20% overnight as it may take a decade or more. Bubbles tend to be remarkably symmetrical. And if I were to choose to live in that shoe box for next 10 years, not only would my properties go down, but maintenance costs would go up, and never mind the opportunity cost of investing my original down payment somewhere else. Point being, I am a renter, and will continue to be for some time.